CLICK ABOVE ON VIRTUAL TOUR FOR THE FULL VIDEO OF THIS PROPERTY! 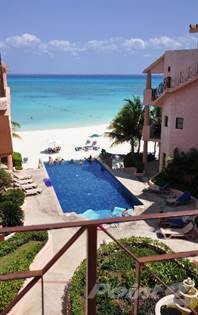 !\r\rNew to the Playa del Carmen real estate market, this stunning 2 bedroom Penthouse for sale in this exclusive beachfront complex. Located on the beach in the heart of Playa Del Carmen and just one block away from the famous 5th Avenue, Luna Encantada is one of the most desirable addresses in the city.\r\rTake the elevator from the secure underground parking garage to the top floor of the building and you will find this remarkable condominium. Once inside, you are immediately greeted by ocean views from the kitchen, dining and living rooms. The kitchen is fully equipped with chef's stainless appliances, granite countertops and custom made hardwood cabinetry. Throughout the condo you will find high quality Caribbean style furnishings and gleaming travertine marble floors which even extend out on to your large private balcony. \r\rThe master bedroom offers a king sized bed, a walk in closet and a full ensuite bathroom. Glass doors lead on to the balcony overlooking Playa del Carmen’s famous white sand beaches and the crystalline waters of the Caribbean. The second bedroom offers 2 queen sized beds and a full ensuite bathroom complete with a bathtub. \r\rTake the stairs up from your balcony to discover an exceptional private rooftop terrace equipped with a grill area, kitchenette and plenty of space for sun loungers, a dining table and a seating area from which you can enjoy unobstructed views of the ocean and the lights of Cozumel at night.\r\rThis penthouse has a superb vacation rental history and promises an excellent return if you are looking for a good investment in Playa del Carmen real estate. Hi, I'd like to find out more information about Luna Encantada. Thanks so much!